The Evil DM: This is how I roll! : What's the first gaming book that made you fall in love? What's the first gaming book that made you fall in love? While most people who know me, know I am all about Dungeons and Dragons and I grew up playing this game like an obsessed mad-man! Its true, my gaming roots go as far back as playing the Classic D&D Redbox with friends in the neighborhood in the '80s but... What was the first gaming book that fell into your hands, that made you fall in love with the game we love to play today? The Advanced Dungeons and Dragons First Edition Dungeon Master's Guide, the cover when the dungeon master in the green robes holding open the big doors. Yeah this baby, Sold it for me! I remember seeing this book flipping through the pages, reading it page by page as my eyes widened in amazement at the information in here. Sure I played D&D with my friends in the park, over someone's house for a few years, but I never owned the books and as a kid, the steep price of $19.95 was like a million dollars to a young me. I remember seeing this very book at a friend's house, and I flipped through it like it was the book of all books or something. 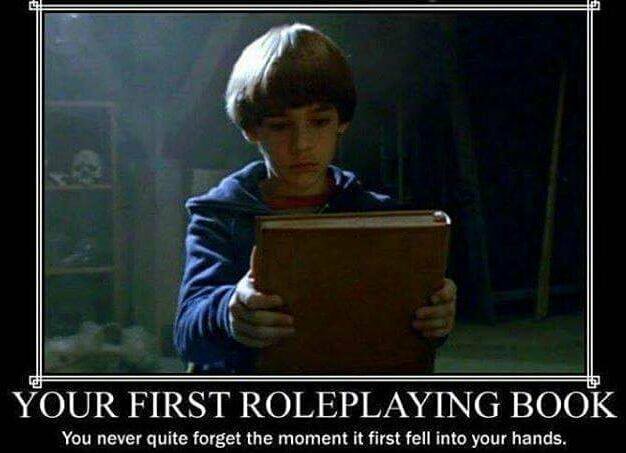 Of course, back then, not everyone had all the books, and only the DM bought the DMG, and you wouldn't dare buy the DM book unless you were the DM, that's just how it was. It was a different time back then, unlike how it is now, there was a different way of thinking about gaming and we respected that. Dungeon Masters bought the monster books, the DM's Guide, and the modules. Players only bought the player's guide and that's it, we didn't dare go purchase anything the DM would have, it was like a violation of the rules somehow in our minds. But the DM in my circle was slowing approaching burn out, and was running games less and less for us. Me now reading the DMG was kind of like a passing of the torch, from old gamer to a new up and coming gamer. I remember running down to the gaming store we had in the neighborhood called Waterloo Gaming Store with my hard earned allowance that I saved for weeks upon weeks. I was a young boy, and if I got $5 a week, that was like a gold mine for me. So anyhow, I got to the store only to be bummed out to find out there was nothing in stock that I wanted, so I had to ask the store owner to order me a book, which would take another 2 to 3 weeks before it would come in.. because ya know in the '80s, there was no internet ordering and everything was done via catalog listing and mailing things in. Boy, was that the longest couple of weeks in my life, but when I got that book, it was brand new and I loved every inch of it as I ran home and cracked that sucker open. Reading it page by page, digesting in every word Gary Gygax had written in that book. This book and this edition of D&D made me fall in love with the game we all play today, I have played this edition as my go-to edition for D&D, trying others, but always falling back to 1e as my one and only love. When 5e was announced, I was against it and would not bother, but after seeing the first playtest packet, and knew they were listening to folks, I decided to go all in. I was playing my first love AD&D 1e, but all the long reading up and testing out 5e with a bunch of other people. It was kind of like cheating in a nerdy way. I loved 5e so much, I started adjusting 5e to make it more deadly and gritty to mimic the 1e style and my friends and those who gamed with me, LOVED IT. But enough about me, what's your first love in gaming? Red Box was my first love. Low Level Mundane Trap Ideas!